Moderately cloudy and not even completely dark at 2340hrs up here at 55N. Still, there were some clear patches so I tried out the portable Zenithstar scope on a camera tripod. Looked at Mars and Saturn then the Summer Triangle of Vega, Deneb and Altair. Thought the views were excellent with Televue Nagler 22 and Panoptic 27mm eyepieces and sharp to the edge. Tried a Baader Hyperion 36mm which was certainly very wide angle but very marked coma at the edges. This was just pure star navigation with no GoTo or polar alignment. Nice, simple fun which gave me a big grin. Probably should scout with my 10×30 binoculars and then use the scope. A red dot finder would be helpful to aim the scope, maybe even a green laser? So cloudy at night. No new imaging. 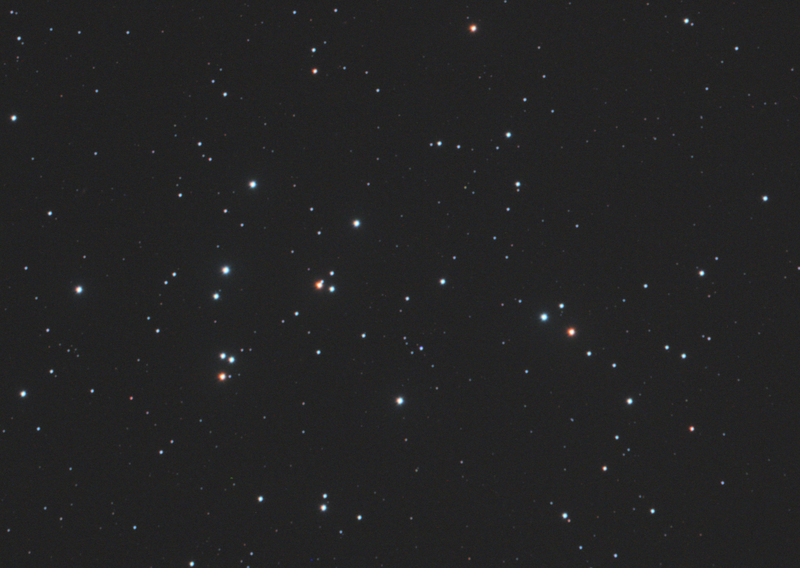 I have reprocessed some shots of M44, the Beehive cluster using some techniques I have picked up recently for Pixinsight. I have tried to enhance the star colours here but keep them natural as well. Method 1: contrast enhance linear data for chrominance before stretching. Method 2: After stretching, use colour enhancement tool with masking at specific points only in the spectrum. Integration of 4 x 5 minute subs (20 mins total). 480/80mm f6 refractor.1.0 x field flattener. Ioptron ZEQ25GT mount. Guided with Orion SSAG/PHD.Canon 60Da @ 800ISO with clip-in CLS filter. Acquired with BackyardEOS and post-processed in PixInsight 1.8 and Photoshop CS 3. Nice little wide angle scope, 418mm focal length. Plan to use it for quick jaunts into back garden or wide field imaging. Just need some clear nights now!